YES! I actually don’t remember thinking it until the words left my mouth and then I knew they were true. I found out my favorite author, Anne McCaffrey would be signing books in Toronto (about an hour away from where we lived) and I begged my mom to take me. I’d read all of the Dragonriders of Pern books. To my surprise, my tired, overworked, single mom actually took me to the bookstore and we waited in line for a very long time. I think storytelling is essential for human beings. It’s how we know we’re not alone. A girl who can’t talk to her parents, might find within a book, a heroine she can relate to—and who can inspire her. A boy with secrets might find a hero with secrets of his own and who survives beneath the weight of them. Stories are a way to discover, and to remember, who we really are. My favorite book is The Summer Tree by Guy Gavrielle Kay (it’s a trilogy called The Fionavar Tapestry and I love this series with a visceral kind of passion). And these books are not my genre! They are my favorite because they reach down deep into my soul and turn me inside out. They make me laugh and cry. They make me feel like I’m good enough. Well, Ann McCaffrey’s advice to never let anything stand between me and my dreams is definitely the best over-arching advice I’ve kept close to my heart my entire life. But a couple years ago Elana Johnson told me that “publishing is not a race”. Between those two pieces of advice, I have the confidence to do things my way and to let it take as long as it needs to take. In your book; Blood Crown, can you tell my Book Nerd community a little about it? Okay, Blood Crown. It started in a desire to write a Cinderella retelling. I think if you knew it was based on Cinderella, you’d be able to see it, but it very much took on a life of its own. While it’s science fiction, Blood Crown is really about human nature—how inhuman humans can be, and how human androids can be. Being a good person has everything to do with how you act than what lies beneath your skin. It’s also about being open to new definitions of yourself, to new opportunities, to love. For those who are unfamiliar with Serantha, how would you introduce her? Serantha has spent most of her life putting all the pieces that make her her into a tiny little box in her heart. She doesn’t need anything, doesn’t want anything, doesn’t feel anything. Of course she does, she just stuffs it away. Stuffs it away. But her truth is a selfless one because when push comes to shove, Sera will always choose her people over herself. And for her, for her story, that’s a good thing. Ah! Great question! I have no idea how to answer! Umm . . . I think it would be fun to introduce Archibald from Blood Crown (he’s an android) to James from the Desolation series (he’s kind of a badass). I think James would think Archibald was hysterical in his proper, trim suits and protocols and Archibald would think James was just the kind of man every man should try to be like because James possesses all the qualities Archibald admires most—kindness, passion and fierce loyalty. What was one of the most surprising things you learned in creating Nicolai? When I first wrote Blood Crown, it didn’t include Nicholai’s point of view. I thought he was arrogant and selfish—pretty much like Sera, too. It wasn’t until I wrote in his sections that I learned he kept a tally of everyone lost in the war against the androids. It wasn’t until he realized the love of his life was still alive that he began to imagine there could be happiness for him, and not just revenge. I kind of have a mad, big love for Nicolai—probably more than any other male character I’ve written. ROFL! Wow, that’s uh . . . Um. I feel like I should LIE and give you some really dramatic, deep dark something but . . . I’ve got nothin’. So I guess all I can think of is when people ask me how I am I always say, “Great!” even though I’m almost always in pain (I have fibromyalgia). I just don’t want to be one of those people who complains all the time, ya know? Plus, when you live in constant pain, you kind of set a new normal so really . . . if it’s just regular ol’ pain, I really am great! I love reading other people’s books. I often think, I wish I could write like that! and I never think my writing measures up to theirs. But then I get some fan mail in which the person tells me how much they love the way I write. It’s kind of hard for me to imagine, because I think, But my stories don’t read like that one or that one that I love. The thing is, we are unique, and so of course our writing voice will be unique. And just like you and I are special as the human beings we are, our writing is special too. It really is most important to be the best you, to write with the most true-to-you voice because that is the voice that is sincere and the on that will resonate the most with readers. Well I just told you about Mike but I’m pretty sure you really don’t want to know about that weird kiss where I pushed him down on the cold snow and kissed him with frozen lips. That I do not love them back. I fall in love easily. I get there fast and hard. But I hate—I hate—making people feel bad, letting them down, hurting them. I’ve been in this situation and I’m sad to say that I “strung him on” for too long because I just couldn’t bear to break his heart. Of course, I ended up hurting him even more. Just this past week, actually. I don’t cry often or easily. But last week I found myself in a sentimental mood, remembering my mom who passed away when I was nineteen. A song she loved popped into my head and I just couldn’t get it out. So I looked it up on YouTube and wham. I was right back to a time with my mom, a time when she would sing and dance and be happy. The song was Jamaica Farewell, by the way. I loved being a teenager in the ‘80’s! Break dancing, Michael Jackson, Depeche Mode, pinball games, Annie Lennox, roller skating, Rocky Horror Picture Show . . . It was an awesome time! My greatest adventure is being a mom! I love how my sons stretch my heart, teach me how to be better, challenge me love deeper. Being a mom, ROCKS! Thank you ALI CROSS for making this giveaway possible. 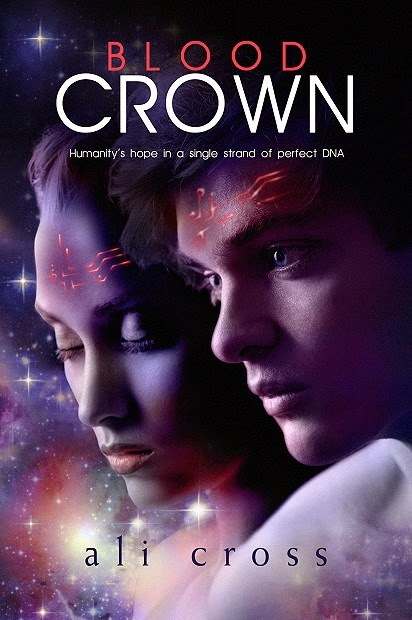 1 Winner will receive a Copy of Blood Crown by Ali Cross.